Several weeks ago, I happened to run across a documentary on the local public broadcasting station that showcased various bakeries around the country. One of them was a Mexican bakery, and all of their baked goods looked delicious. 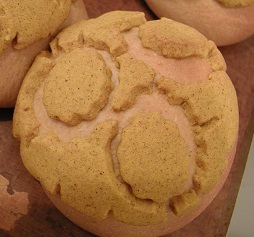 Among the items featured were Conchas, sweet rolls with a sugary topping. Wouldn't you know -- that was what Heather, of Girlichef, chose for our September challenge in honor of Mexican Independence Day! The focus for our challenge was on the topping. How creative could we be? I slightly adapted a recipe I found, using part whole wheat flour, and coconut sugar for the sweetener. I also used coconut sugar in the topping, which, along with the cinnamon, turned the yellow color a sort of mustard shade. Not overly appetizing, but the taste was sure there. And, the rolls, themselves, were fabulous. I'd make the rolls again and forget the topping, which may be against the law, but there you go. The only down side was, that after the first day, the topping had a tendency to crumble easily and fall off, leaving a bare roll. I suffered through and ate them anyway. In a large bowl stir together yeast and the warm water. Let stand for 10 minutes. Stir in the milk, the 1/3 cup sugar, the melted butter, egg, and salt. Stir in 2 cups of the flour. Gradually stir in another 2 cups flour and the ½ teaspoon cinnamon to make a dough. Turn the dough onto a lightly floured surface. Knead for 3 to 5 minutes or until smooth and elastic. Shape into a ball. Transfer dough to a large greased bowl; turn to coat surface of dough. Cover and let rise in a warm place until double in size (1 to 1 ¼ hours). Meanwhile, for topping, in a medium bowl beat the softened butter with an electric mixer on medium speed for 30 seconds. Add the 2/3 cup sugar, beating until well mixed. Stir in the 1 cup flour, the teaspoons cinnamon, and the vanilla. Deflate dough. Cover and let stand for 10 minutes. Divide dough into 12 portions. Shape each portion into a smooth ball. 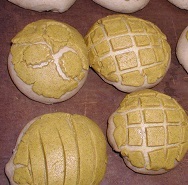 Place balls about 3 inches apart on baking sheets lined with parchment paper. Press down on balls slightly. Divide topping into 12 balls; pat each ball flat. Place one round of topping on each dough ball. Using a sharp paring knife, cut grooves on a scallop shell. Cover rolls and let rise in a warm place until nearly double in size (about 45 minutes). Meanwhile, preheat oven to 375 degrees F. Bake rolls for 18 to 20 minutes or until light golden brown. Remove from baking sheets. Cool on wire racks. Serve warm or cool. 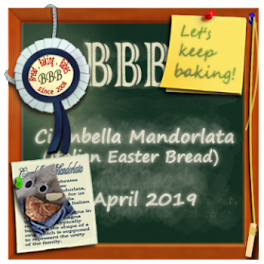 Take a few minutes out of your busy schedule to bake along and earn your Bread Baking Buddies badge. Make a batch of Conchas in your kitchen, and then email Heather a link to your post by the 29th of the month (girlichef@yahoo.com). Note: my kitchen will be out of order for several weeks while I make another cross-country move. Back to the land of earthquakes, tsunamis, mudslides, and wildfires. Never a dull moment! Are you coming to California? Don't forget El Nino! Or droughts! We'll miss your posts. Your bread looks great Judy! Yes, they are definitely delicate (and messy) little rolls. I like your idea of using coconut sugar - something my mom uses in place of regular sugar all the time. I may just give that a go next time! I don't think the colour looks even remotely unappetizing. 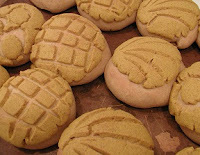 Your conchas look wonderful. Good idea to try a different kind of sugar for the topping. I love the colour, I have that coco-blossomsugar stuff here too, but as it is so expensive I hardly dare to use it. It has a lovely syruppy flavour, and with cinnamon, that must be heaven! 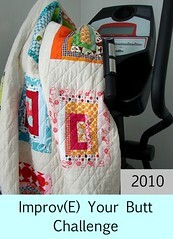 Love your artistic tops! So pretty! Coconut sugar! Fun! And they sure look lovely! I'd be very happy to suffer through with you eating these. Have a safe travel and move!